Official artwork of the Plasm Wraith from Pikmin 3. The Plasm Wraith (アメニュウドウ, Rain Monk) is a boss from the Pikmin universe. The Plasm Wraith is the final boss of Pikmin 3. It lives in the Formidable Oak, and is responsible for kidnapping Captain Olimar prior to the events of the game as he searched for treasure, keeping him asleep by exploiting his suit's auto-sleep function. As Olimar had unwittingly stranded Alph's crew on PNF-404 by taking their Cosmic Drive Key, the Koppaites set out to rescue him and their ship part. Alph, Brittany and Charlie ultimately defeat the Plasm Wraith long enough to retrieve Olimar and the key, although the game's ending reveals that the boss survived the encounter. The Plasm Wraith appears in Super Smash Bros. for Wii U in two roles. 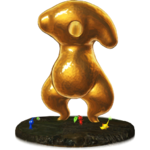 Trophy of the Plasm Wraith in Super Smash Bros. for Wii U. A mysterious life-form in the Formidable Oak, the final area of Pikmin 3. Formed from a gelatinous substance, it normally can't be damaged at all...but with Olimar newly rescued, maybe he holds the key. When it takes humanoid form, it unleashes some terrifying attacks! You'll need all your skills to take it down and finish the game! In Smash Tour, the Plasm Wraith is a red item. A player using Plasm Wraith at the beginning of a battle will cause them to heal damage when they block attacks with their shield, like the Shield Healer equipment effect. The Plasm Wraith appears as a summonable spirit. This page was last edited on February 3, 2019, at 02:04.